And on the subject of gold, there’s a great story about this precious metal in the Colorado River, and old-timers who tried to extract it from the riverbed. There’s gold in the Colorado River, and plenty of it, but it’s not found as flakes; rather, it’s what the old miners referred to as flour gold, extremely fine, and hard to separate from the fine silt of the river bottom. In 1958, as I floated and paddled down the Colorado River with my group of fellow scouts from the Salt Lake Valley, we approached an area known as Bullfrog Rapid. Today, it’s the site of one of the major marinas on Lake Powell. As our tiny ten-man WWII rubber assault rafts rounded a bend in the river, we came face-to-face with what appeared to be a giant train locomotive sitting in the middle of the river. We had no idea what it was, but we could see that it was a giant piece of machinery with massive cog wheels and a boiler jutting up out of the river; also, there were heavy metal buckets attached to pulleys and other odds and ends-pieces of rusting metal that at one time were all synchronized to form a working engine with a lot of moving parts. Still showing above water were large pieces of wooden planking with wooden ribs attached that may have formed a type of decking or floating platform. Everything was covered with sand and driftwood from high-water flooding. That night around the campfire, we heard from our trip leaders the story of the Hoskininni dredge, as the sunken piece of machinery was called. As I listen to the story of how this giant gold mining dredge arrived at the canyon’s edge and was lowered piece by piece to the water’s edge and reassembled, the seeds of adventure and exploration were being sown in my soul. I was fourteen years old and still had all nine of my lives to live, and like a sponge, I soaked up every word, every story, every new experience and discovery from those five days in Glen Canyon and determined, even at that young age, that I wanted to know everything there was to know about the river environs, which included the history of every person that ever entered those canyons, the geology of this fascinating red-rock country, the archaeology of the cliff dwellings found in remote canyons, the star formations that could been seen at night. I wanted to know everything. I was alive and on fire with excitement and enthusiasm for the discoveries I was making. Around that campfire that evening, I discovered a purpose for being, and that purpose would impact, define, and structure my life for the next fifty years and beyond, as well as impact the lives of countless others. The gold dredge was the brainchild of Robert Brewster Stanton, a mining engineer who had led a railway survey through the Grand Canyon in 1898-99. He met many miners who had placer mines along the river, and were trying their best to extract the fine flour gold from the silt sediments, but without much success. After giving it much thought, he hit upon the idea of dredging the sand from the river bottom, running it through a sluicing process, then combining the remaining sludge with liquid mercury. The equation was simple: mercury attracts the gold; heat and vaporize the mercury, driving it off; the gold remains and the mercury is recovered by capturing the vapors and letting them coagulate back to a fluid state. Stone and Stanton contracted to have a massive dredge built at a factory in the east; it was then disassembled and shipped in pieces by rail to Green River, Utah, where it is loaded onto wagons and transported over virtually nonexistent dirt roads to the Colorado River. That was the easy part. Now, the wagons carrying the heavy dredge buckets, steam boiler, connecting chains and wooden planking that would form a floating barge for the machinery, had to be moved from off the flat mesa to the brown muddy waters of the Colorado River, several thousand feet below the canyon rim. The solution for these hearty souls was easy – simply blast a road out of the soft sandstone of the canyon walls; within a few days, the road was completed, and the components of the dredge lay in piles among the aging cottonwood trees whose limbs and branches would soon be sacrificed to fuel the fires of the steam engine that would set the dredge in motion. At the river’s edge, the massive pieces of forged metal that formed the dredge were reassembled and placed on the wooden barge that floated on the water. To keep the barge in place, it was anchored from shore-to-shore by a thick, greasy steel cable. After all was ready, the fire of the steam boiler was stoked and the dredge began to pull muck from the bottom of the river, muck that hadn’t seen the light of day in thousands of years, and deposited it on the sluicing trays where it was agitated and separated. Hopes were high for a substantial return on the time, labor, and money invested in the venture, but at the end of the day, the dredge did not work as Stanton had anticipated. The amount of gold recovered on the first day of operation was valued at $30.15, and on the second day at $36.80. The dredge was a bust and it was immediately abandoned and left to fend for itself. The river quickly devoured it. Fifty eight years later, as part of a Boy Scout rafting trip, I was privileged to see what remained of a unique piece of Colorado River history. Today, it sits at the bottom of Lake Powell under three hundred feet of water. 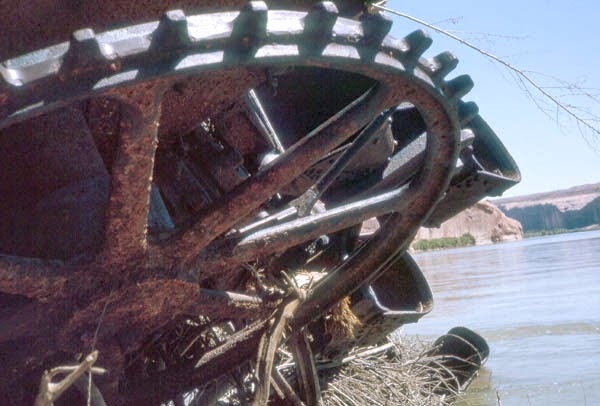 The remains of the mighty Hoskininni Dredge, lying in the middle of the Colorado River; now submerged under 300' of water at Lake Powell, just upriver from the Bullfrog Marina.